I know some people have jumped whole hog into Christmas, but I am still getting ready for Thanksgiving. 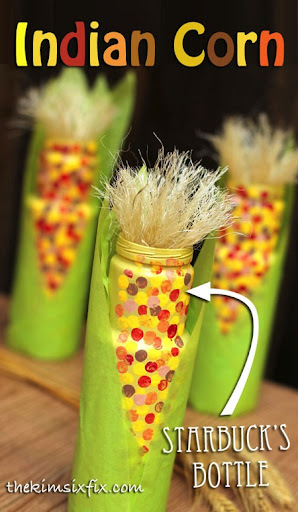 I wanted to do a quick craft with the kids that had to do with Thanksgiving, and after scouring Pinterest I knew I wanted to do something with Indian Corn. As I was browsing, and sipping on my iced coffee.. inspiration struck. A STARBUCK’S BOTTLE. I have been keeping a bunch of empty iced coffee bottles in order to do something similar to the Frappuchino bottles I transformed for Independence day. Because the shape of these are slightly different, I knew they would work perfectly as an ear of corn. The other supplies I used for this were green tissue paper, paint (I used spray paint and craft paint, but you could use only craft paint if you wanted kids to do this craft) and some jute twine. This craft can be 100% kid-friendly. If you prepped all the supplies ahead of time, it would be a great school or scout project since it is easy to get really great results even from young kids. Next we dotted on various colors of craft paint that reminded of Indian corn with pencil erasers. Next I cut out leaves from green tissue paper. You could probably use construction paper too for this, but I thought the tissue paper looked more like real corn cob leaves. the shape and size really don’t matter too much. Since you layer them it is really forgiving. WE started at the bottom and brought the leaves up, just like real leaves wrap up a corn cob. They were a pretty big hit with my kids (5 and 9) and I’m thinking of making them with my girl scout troop. Of course, I’m going to need more than a dozen bottles for that.. But any excuse to drink a few iced coffees is good with me!